“I’m a Christian because Jesus Christ found me and called me, around 40 years ago. I’m a Christian because it makes sense to me, because Jesus rose from the dead, he conquered death and sin and suffering. I’m a Christian because in Jesus I see the God who didn’t say, ‘This is how you lot have got to behave and I’m going to watch you and judge you,’ but came alongside us and lived in the middle of the absolute foulest mess and himself died unjustly young in great agony and bore all that was wrong in this world on his shoulders. “I’m a Christian because in my own experience I’ve run away and he’s met me and yet not been angry with me; when I’ve failed he’s picked me up and healed and strengthened me. While The Times has a tendency to pontificate infallibly, Justin Welby talks movingly about his inadequacies and failings. 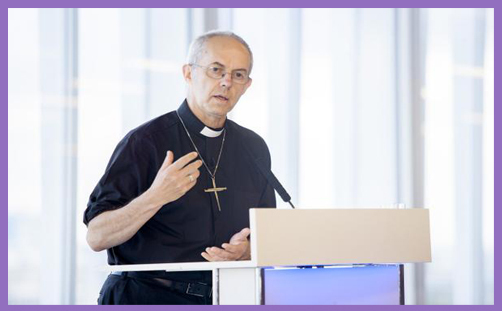 While The Times looks at the Church through the distorting prism of temporal politics, Justin Welby tells them to forget the Church and to follow Christ. This Archbishop is preoccupied with prayer, reconciliation, evangelism and witness. He is passionate about doing mission and the “inescapable reality” of Jesus in his life. All The Times sees is foodbanks and Wonga, interspersed with sexuality and gender. That is the inescapable reality of media obsessions and Church caricature. Archbishop Justin told News UK staff (which also includes The Sun, Sunday Times and the TLS) that he found being a Christian “a reasonable thing to be” because “the best answer to where was Jesus’s body after the crucifixion is that he rose from the dead”. Reason is a good place for the Christian to start when speaking to journalists – even Christian journalists who prefer to lecture the rest of us with their righteous shoulds and oughts. They may become irritated or inflamed, but the truth of the facts tends to have that effect on those who are so persuaded of the truth of their facts that there is nothing more to discuss – if, that is, they deem you worth talking to at all. The Archbishop spent most of time talking about “the person and presence of Jesus”. But you won’t read about that in The Times. He explained that “Christian faith doesn’t hide us from the cruelties of life. Jesus himself faced every aspect of the cruelty of life that is possible. It’s just in it he is there in it in the middle of the mess with us.” You won’t read about that in The Times, either. But you won’t read about that in The Times, either. Or perhaps you will, but you’ll find it couched in a trite column as ‘Justin Welby’s holy disorder‘, leading with chatter about the oil industry and fat-cat salaries, juxtaposed with nuggets of tittle-tattle about George Osborne and Bach . If all that Times‘ journalist can glean from Justin Welby is the snarl of ‘holy disorder’, the derangement is theirs. And that is why the Archbishop visited them with the gospel truth. It is not the healthy who need a doctor, but the sick. Where is the Conservative Party's sense of intergenerational justice?